In the 1690s most of the land on Essex Street and Washington Square was an apple orchard that belonged to Bridget Bishop, the first woman executed for being a witch. When she was executed the sheriff confiscated her property and divided it up amongst other Salemites. In 1830 the property on Washington Square was used as a headquarters for The Salem Marine Society, a group that helped take care of aging sailors and captains and provided relief to families of sailors that died at sea. In the 1920s a deal was struck between Frank Poor, a local businessman and The Salem Marine Society. The Salem Marine Society would be given a room on the roof of a new hotel to meet and conduct business in return for permission to build the first modern hotel in Salem. In 1925 the Hawthorne Hotel opened amidst much fanfare including a parade in downtown Salem. Due to its modern amenities the Hawthorne Hotel quickly became a favorite place to stay for tourists. Over the years many famous people have stayed in the hotel while visiting Salem. Former President George H.W. Bush stayed at the hotel as well as Bette Davis, Liza Minelli and Johnny Cash. 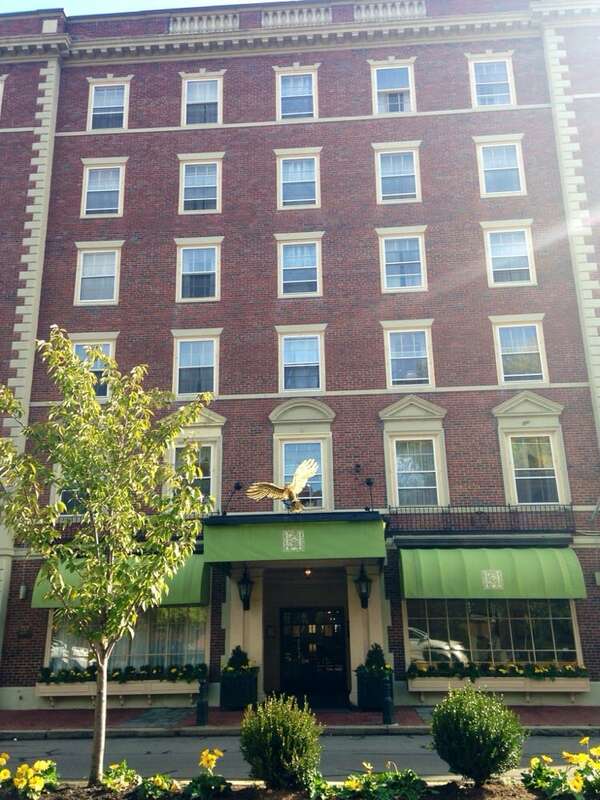 The cast of Bewitched stayed at the Hawthorne Hotel while shooting the television show in town in 1970. Due to so much history it’s really no surprise that guests believe the hotel is haunted. The ghost of Bridget Bishop is thought to reside in room 612 as well as the hallway of the sixth floor. Numerous guests have reported seeing the apparition of a woman in 612 and tell stories of watching doorknobs jiggle and eventually open by themselves. Lights have been known to flicker off and on and faucets seem to turn themselves on in the bathrooms. Guests that stay on the sixth floor have also mentioned smelling apples during their stay. The third and sixth floors seem to have the most paranormal activity. Guests on those floors have experienced something tugging on the bed sheets in the middle of the night as well as the sensation of someone poking them. Whispers, Crying and laughter have also been heard in the hallways at odd hours. Cell phones and other electronic devices have been known to not work properly. Guests have been known to drop calls for no reason or to experience a lot of static while trying to talk on their phones in the hotel. A banquet hall known as ‘The Lower Deck’ is also a hotbed of paranormal activity. Hotel staff have found the room in disarray after preparing it for an event. Download the Salem Ghost Map in iTunes to learn about the Hawthorne Hotel and over 30 other haunted locations in Salem.